Very easy to use, filter holders just snaps to the adaptor ring. 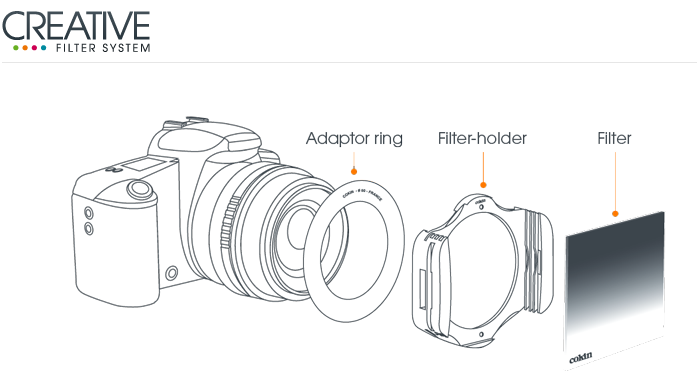 They have been designed to offer the best user experience : rotating a polariser, sliding a filter into place, fine-tuning a gradient filter and so on. Once attached on your lens, you can use several filters at the same type. Lightweight and robust, filter holders will become your best companion for creative moments. Quick to set up and easy to use, Cokin CREATIVE filter-holders are conceived to facilitate the work of those who have made the judicious choice of filtering directly, while shooting. Their lightness and flexibility of use offer two major benefits: on one hand, they do not alter the fluidity of manual focusing, and on the other hand, it exerts no strain on the built-in motors of auto-focus or zoom lenses. The materials used in its manufacture resist large temperature changes and the ‘granite’ coating of the filter-holder is always agreeable to the touch, no matter what the working conditions. Although it may not be immediately apparent due to their simplicity, Cokin CREATIVE filter-holders are a remarkable compilation of technologies and a fantastic industrial accomplishment!